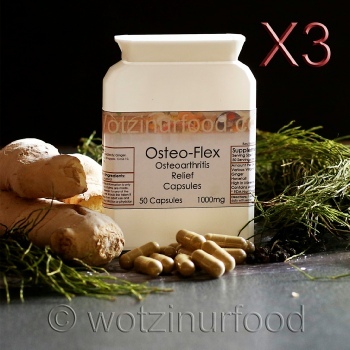 Introducing Osteo-Flex from Wotzinurfood. A preparation designed to relieve joint pain caused by Osteo-Arthritis and other inflammatory conditions. With ginger, horsetail, CoQ-10, brewer's yeast and black pepper for added absorption. In combination with these ingredients, other additional benefits include stronger hair and nails and also potential hair growth stimulation, and a reduction in symptoms of Proteinuria. It also helps with liver and kidney detox and a possible control for diabetics. Horsetail is used in Europe for centuries to treat fluid and kidney conditions, but is also beneficial for joint problems including Osteoarthritis. It is also beneficial for weight loss and menstrual and internal bleeding. Another benefit is help with balding and can help strengthen hair and brittle nails. Horsetail may induce B1 deficiency, but this is offset with the addition of Brewer's Yeast. Ginger is a powerhouse spice which helps the body with a multitude of problems but it is chief in maintain the immune system. Ginger helps fight off colds and flu, like Turmeric, helps fight pain and inflammation benefiting those with forms of arthritis, it boost the circulation and helps reduce period pains and headaches. Ginger benefits the roots of the hair, stimulates growth and reduces hair loss. Ginger is excellent in soothing the stomach and is used for many ailments like IBS, wind, stomach cramps, diarrhoea, spasms and even ulcers without the need of drugs. It has been shown to benefit the reduction of blood sugar therefore aiding diabetic symptoms, lower cholesterol levels and has also been associated with the prevention of Alzheimer's Disease. Brewer's yeast is very high in B Vitamins including B1, B2, B3, B5, B6, B9 and Biotin, which is essential to maintain good hair growth. It is also useful for skin and nails and helps with liver control and acne. Brewer's yeast also helps reduce inflammation, so is beneficial for many forms of arthritis. It is also a useful source of protein being 50% which is regarded as high. As it also contains high levels of Chromium, it is suggested it is beneficial for diabetics. CoQ-10 has been beneficial for people who have been taking statin drugs, which along with smoking, drastically deplete the body's stores of CoQ-10, and as age creeps in, the body can't replace this as quick as needed, so our energy levels, as well as our immune systems start to get compromised, and various diseases and conditions start to develop. Because Co Q-10 is packed with antioxidant it helps reduce signs of aging and also benefits hair, skin and nails. Supplementing with CoQ-10 can help treat high blood pressure, boost immune system eliminating fatigue, reduce high cholesterol and stabilise blood sugar. It can also help with gum disease, low sperm count and migraines and reducing muscle pain, especially after exercise. Our Coenzyme Q-10, unlike many synthetic versions on the market, is naturally fermented with extremely low levels of Arsenic, Heavy Metals including Mercury. No chemicals or solvents are used in the production of Wotzinurfood Coenzyme Q-10 Powder. Black pepper contains a good amount of minerals like potassium, calcium, zinc, manganese, iron, Vitamin K and magnesium. Potassium is an important component of cell and body fluids that helps controlling heart rate and blood pressure. Manganese is used by the body as a co-factor for the antioxidant enzyme, superoxide dismutase. Iron is essential for cellular respiration and blood cell production. It has also been found that piperine can increase absorption of Co Q-10 Enzyme, selenium, B-complex vitamins, beta-carotene, and turmeric, as well as other nutrients from the food. Black pepper can revitalise hair and skin and is beneficial to reduce greyness.